It was a night where everything seemed to go right for the Concordia Stingers. 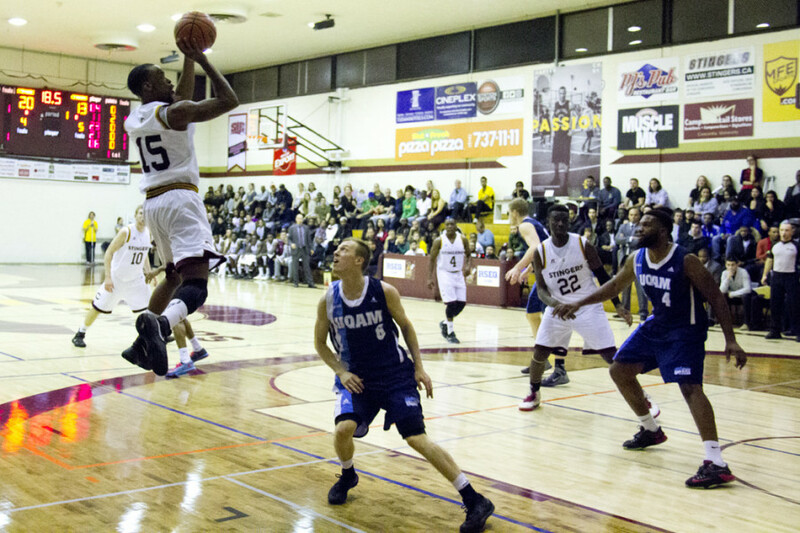 The UQAM Citadins were stunned at home by a defensively sound Concordia Stingers team on Thursday night, losing by a score of 74-61 at the Centre Sportif UQAM. Concordia was led offensively by Ken Beaulieu, who scored 22 points in the victory. After being on the receiving end of four consecutive losses, Concordia’s change in tactics led to a convincing, and much needed, win over the second-place team in the Réseau du Sport Étudiant du Québec, the Citadins. The Stingers came out hot against the Citadins, not allowing their opponent to score until midway through the first quarter of the game. Concordia also only allowed five points in the second quarter, and ultimately held UQAM to their third-lowest scoring game this season. “It was good, [the performance], better than our last two games. We improved and made game plan adjustments to win and we won,” said Stingers guard Jonathan Mirambeau. Despite their defence, offence is an aspect that Stingers head coach Popovic will look to improve as well, as his team only completed 35 per cent of their field goals throughout the entire game. “I think offensively we still had some struggles, but I was very happy with our defence and rebounding tonight: keys to winning games,” said Popovic. Two players, forwards Schneiders Suffrard and Ken Beaulieu, were crucial for Concordia in Thursday night’s win, scoring 20 and 22 points respectively. “I thought they were both terrific,” said Popovic. “Every time [the Citadins] made a big shot, those two guys made a big shot on our end. “They’re our best players so that’s what we expect of them. They were struggling the last two games, so they came to play tonight and I’m very happy with how they responded,” added Popovic. After coming off a few quiet performances, Beaulieu was relieved with the win, and is concentrated on moving forward. The forward scored a combined 28 points in his last three games, including a one-point game against the University of Prince Edward Island during the Dalhousie Tournament. “It feels good. The last three games I didn’t play well, so yeah, it feels good, good to be back,” said Beaulieu. The Stingers will hope to add more salt to UQAM’s wound as they will play against each other at the Concordia Gymnasium on Saturday afternoon at 4 p.m. A win on Saturday for Concordia would mean the team would fall into a tie for second place in the conference with UQAM.